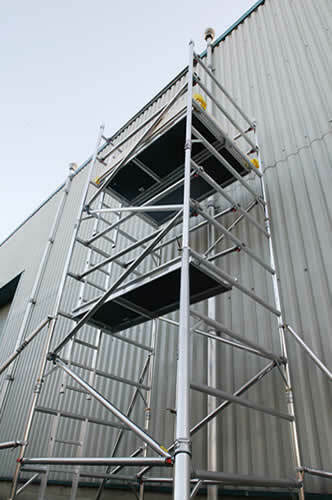 Highest quality alloy tower from just £41.60+VAT per week. One of the most important factors if you are working in the construction industry is making sure you and your contractors stay safe. That means, as a key element you cannot afford to ignore, making sure you have the right equipment for the job. The proper kit is especially important if you are working at height. Falls from height are the most common cause of injuries and fatalities in the workplace. But there is no need to take risks when an alloy tower provides the obvious answer. 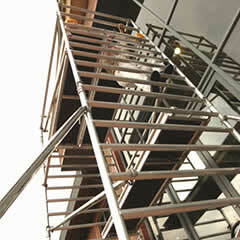 Alloy tower hire is easy and affordable. Buying an alloy tower and other similar equipment can be pretty expensive, and especially if you are merely undertaking a one-off job it simply might not be worth it. 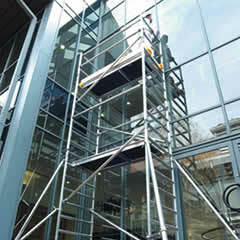 Alloy tower hire is often the better option. With an alloy tower, you can work at height on just about any job in perfect safety. But perhaps the best bit about hiring a tower is that once the job is finished you can send the alloy tower back, so you don’t have any of the problems and expense associated with storage or transportation. Our alloy towers are lightweight and easy to manoeuvre, and are ideal for working across a very large area. Because safety is so important, all of our alloy towers are inspected, checked and cleaned every time the equipment is returned to our headquarters. That means that when you hire one of our alloy towers you can be absolutely sure it will be in tip-top condition. Concerned about assembling and dismantling an access tower? No worries. All the equipment comes with a basic user manual. The colour-coded brace system used is guaranteed to ensure that even a first-time user can easily put an alloy tower together in the right way. Extra safety features such as guard rails and toeboards come as part of the package, and you can also hire extras such as Scafftags and scaffold alarms. Hiring an alloy tower is really simple. Just give us a ring, and your equipment will be on its way to you next day, without fail, in perfect condition and ready for use. Our experts are always on hand, ready to advise you on choosing the right kit for the job, so that you can be sure you have the best equipment, perfectly suited to even the most specialised task.